I have made some significant updates to my python3-built OSX toolbar app: steemticker-osx. I have added a portfolio feature so users can input their STEEM balance and track its price. Step 1: Click "Portfolio Setup"
You will be greeted by this window. 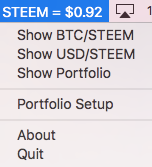 Input the amount of STEEM you own (integers and floats are both acceptable entries, just don't input any letters or symbols besides a decimal point), and click ok. Step 2: Click "Show Portfolio"
It's as simple as that! Your portfolio value will now be sitting in your toolbar and will update by itself! In version 1.3, I plan to add other currency pairs to the price ticker. That's it for now! One quick thing, if anyone has any suggestions, please reply to this comment with your ideas! I'm looking for new features to include in the next version of the app.